How to choose your perfect kitchen colour scheme for your home. Here at Starplan, our fitted kitchens showrooms are full of an impressive amount of displays all in a range of colours and finishes. If you’re looking for a kitchen with a difference, why not base your kitchen all around one colour? The kitchen colour of choice in 2017 was definitely blue and mainly dark blue! When blue cabinets are paired with cream or grey tops they create a cool and refreshing kitchen vibe. 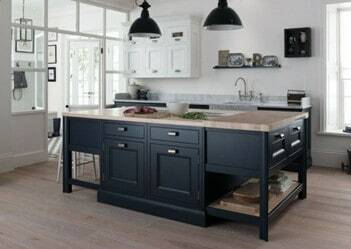 Dark, inky blues can be a nice change to the typical black or dark grey kitchens, whilst still maintaining that classic feel. Having a green kitchen is the next step after blue. We don’t mean bright greens, we mean dark, autumnal, forest greens. However, more and more people are choosing to go with lighter greens which pair really well with light greys and creams. That style of colour scheme flows really well in traditional kitchens. Grey is as popular as it always has been. We’ve never seen a drop in popularity for grey fitted kitchens and we aren’t surprised! Grey is the perfect colour to go with whatever style of kitchen you choose, all thanks to the different shades and variations. A grey kitchen is also the perfect background for just a simple splash of colour from walls, tiles or even the flooring! Not keen on having your kitchen all one colour? Well why not go for a contrasting fitted kitchen? Choose one colour for your kitchen cabinets/units and then why not choose a contrasting colour for your island or kitchen pantry? So if this blog has piqued your interest for a coloured kitchen, why not come down and see one of our kitchen design experts? We have 6 kitchen showrooms; Dungannon, Coleraine, Newtownabbey, Belfast, Portadown and Bangor. Most of our stores are open 7 days a week and full of helpful staff ready to create your dream kitchen!